The property and casualty insurance industry today is experiencing exciting changes. New technologies are being developed that better serve the insured while maximizing profits for innovative organizations. However, rampant catastrophic losses resulting from natural disasters, declining margins due to economic pressures across the globe, and rising customer expectations are undeniable realities which the P&C industry battles. 2019 is looking to be a promising year for insurers who emphasize technology and digitization, agility, and satisfying their consumers. Insurance APIs, microservices, cloud-based software, artificial intelligence, blockchain, and more will gain prominence throughout the property and casualty insurance industry in 2019. Insurers who can get to market quickly with niche, greenfield products will gain a competitive edge over the ones that cannot. The average consumer today is more educated, mobile, and their expectations for service are soaring. Insurers who provide helpful information and products to users wherever they are will see increases in market penetration and unparalleled success in 2019. Advances in both hardware and software have changed the landscape on how insurance carriers sell their products and how quickly they can get them to market. 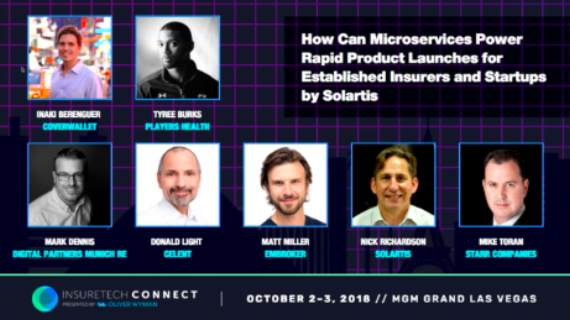 For example, using Solartis PAS microservices, insurers can sell their product on any device (i.e. smartphones, desktop computers, tablets, smart watches, etc) and get them to market in record time (i.e. under 90 days). View our extensive API Catalog to see our wide-range of available microservices that support the full policy life cycle process and check out our microservices hackathon winners to see fun and interesting applications using microservices to solve real-world insurance problems. Artificial intelligence, with the right software architecture in place, can help insurers issue behaviorally priced policies and leverage chatbots to improve the purchasing experience for consumers. Many insurtechs are also using AI to bring highly differentiated services to market, like Tractable, which can instantly predict repair costs for all kinds of damages enabling rapid settlements and straight-through processing for claims. For more on how insurers stand to benefits from artificial intelligence, read our blog post recapping AI takeaways from ITC 2018 and addressing common applications of the technology. Mike Toran, CIO of Starr Companies discusses, in this panel discussion from ITC 2018, how organizational agility requires a total shift in culture and mindset. Conversely, speed-to-market is a fundamental metric for determining how agile your organization truly is. Recognizing an opportunity to diversify your portfolio is only the first step; capitalizing on it is another step altogether. Unfortunately, monolithic software architecture translates into outdated operational capabilities. This means getting a greenfield product to market could be a costly undertaking which takes years to roll out. Under these premises, insurers have a difficult time diversifying their portfolio of insurance products, which leaves them subject to the aforementioned margin pressures in property and casualty. Being quick to act on new opportunities, and offering a wide variety of products for different demographics in varying geographic locations, is one great way to spread your risk and maximize market capitalization. Don’t limit your offerings to the tried-and-true auto, worker’s comp, and commercial liability coverages. Find new opportunities and seize them by overhauling the way you sell and manage your insurance products and use this opportunity to train your employees to think differently. The last property and casualty insurance industry trend we’ll address here is rising consumer expectations. The proliferation of mobile devices and personalized service from organizations in other industries powered by technology have impacted the way consumers view insurance. For example, it’s not uncommon for a buyer to go online, conduct a five-minute search, and have the exact desired product arrive at their doorstep in less than 24 hours. The insurance purchasing process looks nothing like that today. By incorporating SMS alerts, chatbots, mobile responsive UI, and highly personalized coverages to target demographics, insurers can keep pace with leaders in other industries and maximize profits. To learn more about the paradigm shift the insurance industry is experiencing and how you can rise above the competition, download our premium content offer: “Microservices Architecture and the Insurance Paradigm Shift”.